Let's take a peek into the crystal ball, shall we? So, what’s new with Deflategate, eh? Absolutely nothing, thank GOD. All the nonsense got sorted out — for now, at least — and that just leaves us with: football. Glorious, exciting football. 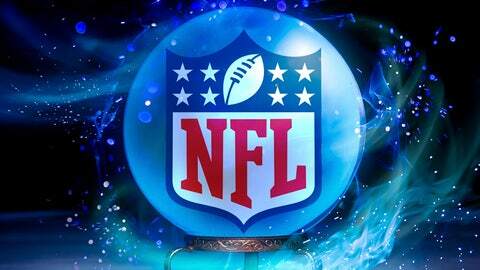 Is anyone else giving thanks to any and all higher powers that the NFL regular season is here? What a feeling. And in honor of Week 1, here’s this week’s topic: Give me an outrageous prediction for 2015 that could actually come true. Judging by your responses, I’m going to divide the answers into two groups. As long as the Eagles can keep Sammy on his feet and out of the trainer’s room, Bradford can really excel in Philly’s quick-strike offense. I can’t wait to see how things unfold. If things go well, we could see the rebirth of the Sam Bradford we saw at Oklahoma. I’m really high on the Dolphins this year. Like serious addiction high. Maybe even sniff-Sharpies-under-a-bridge high. But does that mean I’m ready to go all in and say Miami will dethrone New England? Yeeeaaaah . . . no. I’m not dumb. Every few years some talking head will pipe up and say, "This could be the year the Patriots get taken down!" Of course, nothing like that happens and Belichick and Co. waltz their way to a division crown and home-field advantage in the playoffs. I refuse to pick against the Patriots. I just won’t do it. This is my questionable reputation we’re talking about here. Important stuff. @RealSidSaraf @NFLonFOX #FoxMailbag Falcons rebound into the playoffs, Julio Jones has a historic year. That’s not that far-fetched. The Panthers won the dumpster fire that is the NFC South last season without getting to eight wins. There’s no reason to think the Falcons can’t get back there. They definitely have talent on offense and new head coach Dan Quinn has clearly brought his attacking style of defense from Seattle. This could be a fun team to watch. But of course, once they get back to the postseason they’ll probably bow out early again. If the Raiders have a "commitment to excellence," the Falcons have a "destiny of disappointment." There’s a lot to like about the Bills. Run down the list: solid defense, LeSean McCoy, Sammy Watkins, Rex Ryan, etc. Even Tyrod Taylor has me believing a bit. But a Super Bowl contender? If they can get in the playoffs, anything can happen. I wouldn’t put any money on the Bills getting to Levi’s Stadium, but I would enjoy seeing other people put their money on it. @RealSidSaraf @NFLonFOX #FoxMailbag Robert Griffin III reclaims the role as starting QB, leads the #Redskins to the playoffs. As strange as that would seem right now, stranger things have happened. Kirk Cousins might be the starting QB in Washington at the moment, but this is the NFL and things happen. One untimely hit or one wrong step and RG3 is back in the lineup. And once he’s there, who’s to say he won’t make miraculous progress and bring the ‘Skins back into the playoffs? Like I said, stranger things have happened. The Cardinals reached a Super Bowl once. Peyton Manning has already lost feeling in his fingertips. I shuddered when I read that story. Whenever the pass rush gets near him this season I’m going to close my eyes and hope he doesn’t get hurt. Peyton, everyone loves you — except Patriots fans, and they don’t matter. I don’t want to tell you what to do, but . . . maybe this should be your last year. It’s OK, you’re a Hall of Famer already. Don’t risk doing permanent damage. Yeah, yeah. Then he’ll be the first NFL player to climb Mt. Everest. Then the first player to reach low-Earth orbit. The first NFL player to cure every known disease on the planet . . . I don’t want to call him Mr. Perfect, because that name is reserved for the one and only Curt Hennig. However, JJ is Mr. Too Perfect. He’s unbelievably great . . . but almost in an annoying way. Eddie Lacy has no business throwing the football with Aaron Rodgers under center. That being said, I would love to see that happen. You could line up Lacy in the wildcat or maybe do some kind of double-reverse tomfoolery. Why not try it once? I just need to get Mike McCarthy on the phone . . . Your prediction would have been more valid if the Browns hadn’t released Pryor on Thursday. Not sure how bold that prediction is, but I’ll accept it. Romo has just as good a shot as any of the usual suspects. Had him on my fantasy team last year and I can attest: When Arian is healthy, he’ll put up stats. @RealSidSaraf @NFLonFOX #FoxMailbag Arian Foster will rush for 1000+ yards and Texans will make the playoffs. But the Texans had him for most of 2014 and they still fell short of the playoffs. It’s all about the quarterback in Houston. If Brian Hoyer can keep things steady, this team has a decent shot at the postseason. Noah, you and I will have a serious bro-hug session if this happens. Now, let’s move on to . . .
@RealSidSaraf @NFLonFOX #foxmailbag Ravens go 19-0. Closest margin of victory is 45 points. @RealSidSaraf @NFLonFOX The Patriots lose the first four games WITH Brady. @RealSidSaraf @NFLonFOX #FoxMailbag the #49ers win the SB in their house! @RealSidSaraf @NFLonFOX #FoxMailbag #JManziel2 leads #Browns to Super Bowl 50!! @RealSidSaraf @NFLonFOX Patriots win the super bowl in a land slide over whatever pointless team shows up .